People who grind or clench their teeth at night often wake up with a headache, sore facial muscles, the jaw joints feel tender and the teeth can also ache. Grinding is a common occurrence for many people and can develop at any age. At Dairy Lane Dental we can help you with this problem. 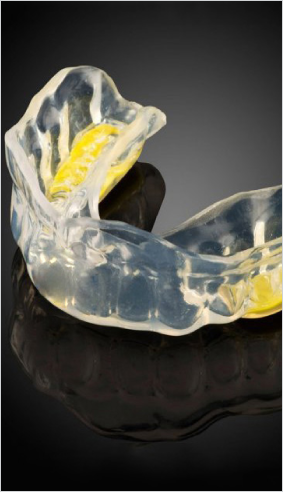 We can fabricate an appliance, (“night guard”) that will provide protection to the teeth, prevent wear and help the movement of the jaw to allow the muscles to relax. Whether you are playing baseball, hockey, soccer or skateboarding, a sports mouthguard is a good idea. It protects the teeth and gums from damage and injury. Remember, it is easier to wear a mouthguard than to fix or replace a lost or broken tooth. Ask a team member for more info today.